EAST WHITTIER – Sculptures inspired by Pablo Picasso and metal embossing influenced by Vincent van Gogh are among dozens of installations created by East Whittier City School District K-8 students that are currently on display at the Whittier Art Gallery. East Whittier’s Annual Student Art Show, which closes April 29, features a spectrum of art designed by beginning and advanced art students including collages, two-point perspectives, pastels, textile art, mobiles, graphic books, propaganda posters and examples of the papier-máché craft known as alebrijes, popularized by the Mexican artist Pedro Linares. The April 19 opening featured a performance by members the East Whittier Middle School string orchestra. The show continues Wednesday, April 26 through Friday, April 28 from 1 to 6 p.m. The exhibit’s closing ceremony, on Saturday, April 29, from 1 to 4 p.m., will include the Granada Middle School marching band. Granada Middle School student works were influenced by Europeans masters such as Picasso and van Gogh, as well as photorealist collages inspired by American-born artist Chuck Close, landscape collages made of ripped up magazines, and pattern drawings known as zentangles. “Creating art is a way for me to calm down, it helps me get through some of my more stressful classes,” Granada eighth-grader Alyssa Prieto said. East Whittier Middle School art teacher Diana Martinez introduced her students to the 3-D art known as alebrijes, where cardboard, Styrofoam and wire are combined with papier-máché to create fantasy animals which reflect the artist’s personality. Seventh-grader Grace Perez chose a unicorn, a dolphin and a sea turtle for her design. “The unicorn is unique and mysterious, the dolphin is playful and active, and the sea turtle is shy,” Perez said. Murphy Ranch Elementary students created oil pastels based on the Impressionistic plein air landscapes of Monet and metal embossing in the style of the van Gogh’s “Yellow House” painting. The EWCSD student art show is supported by the East Whittier Arts Foundation (EWAEF), a community-based nonprofit that works with EWCSD to increase support for the arts, providing financial resources and vocational opportunities for students. 042617_East_Whitier_Art_Show1: Granada Middle School eighth-grader Alyssa Prieto exhibits her landscape collage made of ripped magazine pages, during the opening of the East Whittier City School District Annual Art Show on April 19 at Whittier Art Gallery. 042617_East_Whitier_Art_Show2: Murphy Ranch Elementary School fourth-graders Daniela Ramirez and Julia Masikan display landscape paintings influenced by Impressionist artist Claude Monet, during the opening of the East Whittier City School District Art Show on April 19. 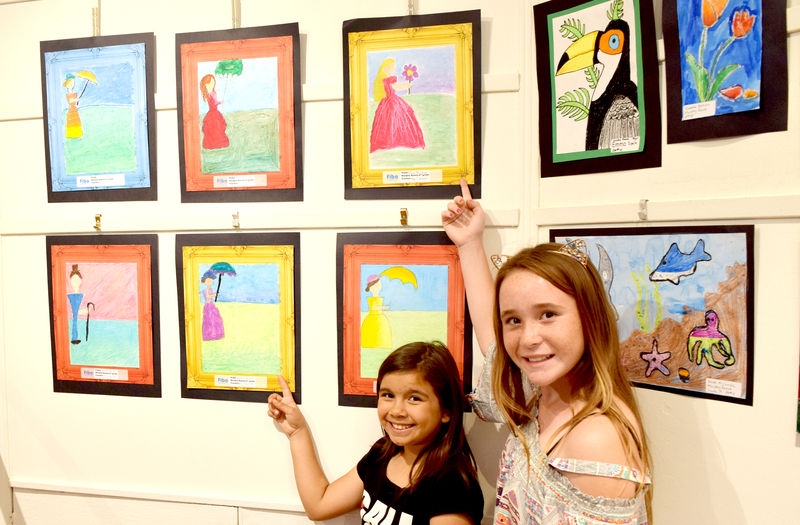 Murphy Ranch Elementary School fourth-graders Daniela Ramirez and Julia Masikan display landscape paintings influenced by Impressionist artist Claude Monet, during the opening of the East Whittier City School District Art Show on April 19. 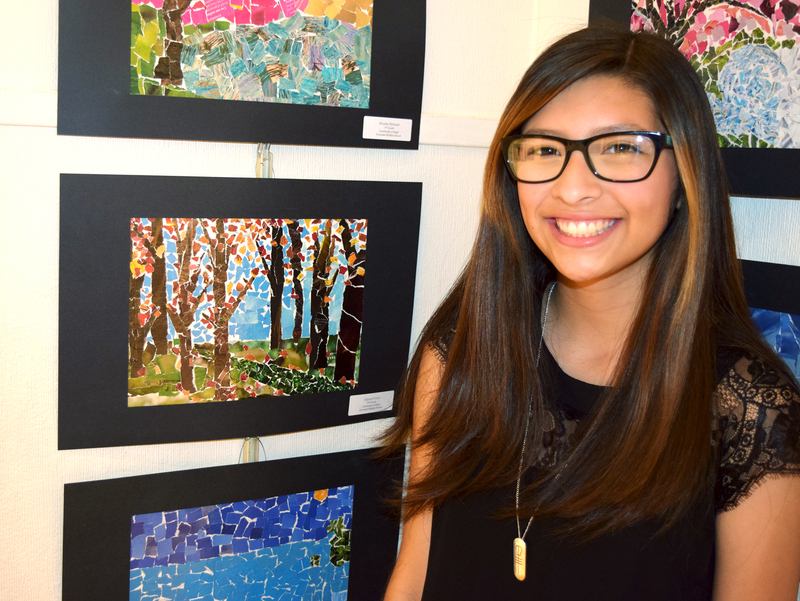 Granada Middle School eighth-grader Alyssa Prieto exhibits her landscape collage made of ripped magazine pages, during the opening of the East Whittier City School District Annual Art Show on April 19 at Whittier Art Gallery.